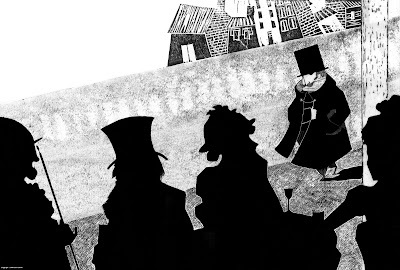 by Ars in Fabula, master in illustration finalised to publishing, Fabbrica delle Favone, Macertata. It's an exhibit that collects all the works by the alumnus who already obtained their degree, some of which have already obtained important recognitions some of which in publishing: such as Sara Gavioli (see illustration reproduced here below) who has illustrated “La governante” by Osmont for Orecchio Acerbo publishing house, and of Marco Lafirenza who has published “Io credo agli unicorni” by Morpurgo with Rizzoli Publishing, but also with other important recognitions. In fact, Laura Paoletti, has been selected at the Bologna book Fair for the internarional exhibition devoted to Gianni Rodari, titled “Grammatica delle figure”. The plate you'll see at the show illustrates one of Rodari's nursery-rhymes titled "Lo spazzacamino", that is part of the collection "Filastrocche in cielo e in terra". The grand-opening will be introduced by Walter Fochesato. *100 tales, 100 images – ARS IN FABULA, the master in show! The illustration has been reproduced with the permission of Ars in Fabula, Fabbrica delle Favole. All rights reserved.